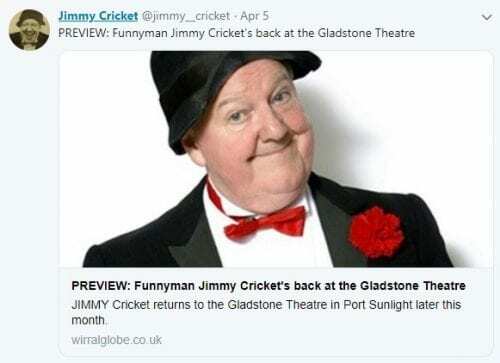 Jimmy Cricket enjoyed his latest show at the Gladstone Theatre in Port Sunlight at the weekend – and clearly others did too. The popular Northern Irish comedian, 73, has performed several times in the past at the Greendale Road venue on The Wirral, the latest being on Sunday 14 April. Jimmy Cricket takes his laughter tour to the Gladstone Theatre in Port Sunlight at the weekend. 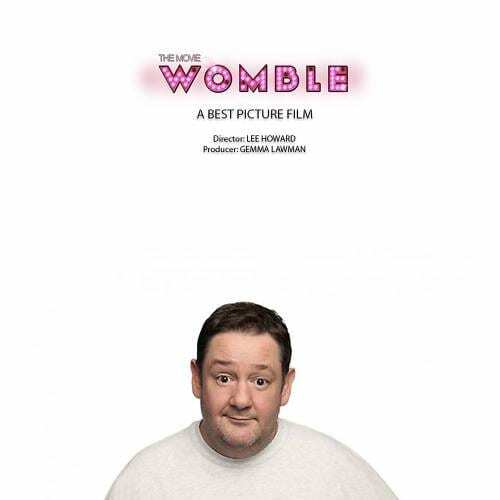 The popular Northern Irish comedian performs at the Greendale Road venue on Sunday 14 April. The 73-year-old entertainer says he has had shows at the theatre many times over the years and that he was “looking forward to coming back”. He told the WirralGlobe: “The theatre is in a beautiful village and every time I visit, it’s like stepping back in time when I visit. Port Sunlight is a model village and suburb in the metropolitan borough of Wirral, Merseyside. Tickets for the show can also be bought by contacting the theatre’s box office on 0151 643 8757. One of Jimmy Cricket’s latest pre-Christmas shows was at a club on Merseyside. 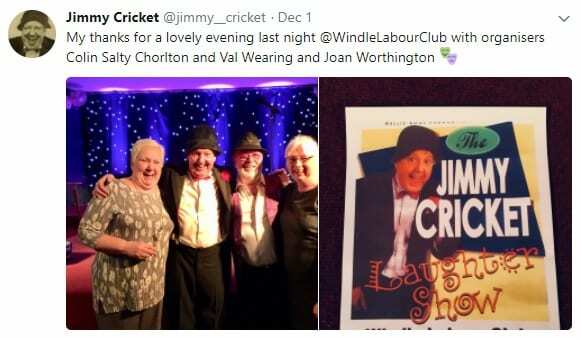 The famous Northern Irish entertainer tweeted that he had had “a lovely evening” at Windle Labour Club in St Helens on the last day of November. 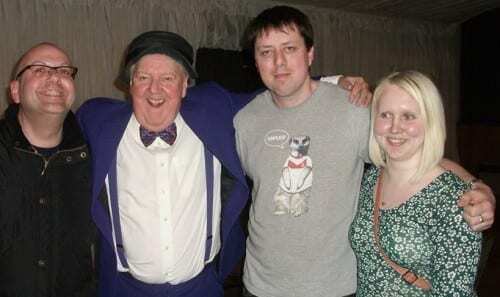 Famous entertainer Jimmy Cricket has expressed his immense pride after daughter Katie won a prestigious playwriting competition. 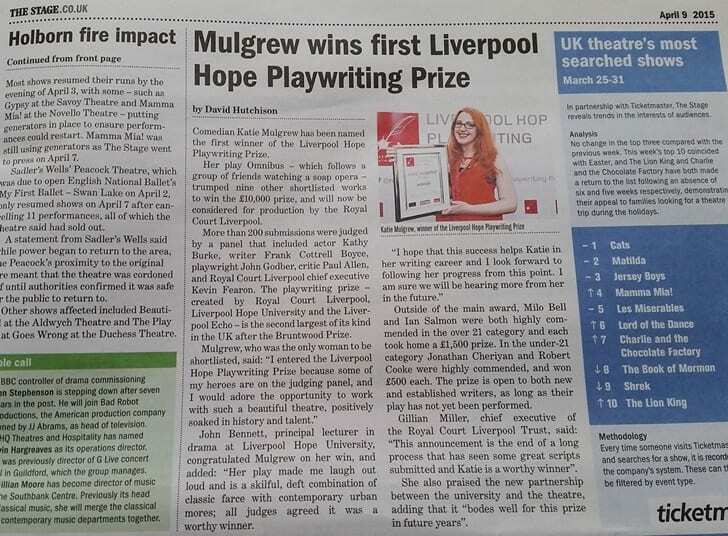 Katie Mulgrew, 30, was the winner of the first ever Liverpool Hope University playwriting prize, with her work entitled Omnibus, which follows a group of friends following a soap opera. 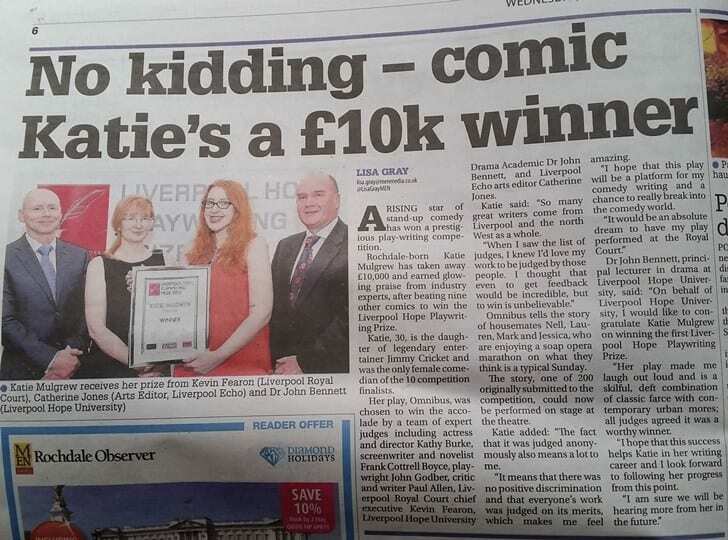 Not only did she earn herself £10,000 in the process, but she now has the opportunity to see the play produced by the Royal Court Theatre in Liverpool, one of the partners for the competition along with the Liverpool Echo newspaper. She was the only female comic among the 10 finalists. Jimmy Cricket enjoyed an “interesting and thoughtful” Q&A with some of his fans when he appeared in Ormskirk. The famous entertainer was at the town’s Civic Hall earlier this month for one of his ‘Audience with’ shows, an evening of stand-up comedy. These events have an interesting twist in that they feature a segment where members of the audience can ask Jimmy a question. Ormskirk’s show was hosted by Jimmy’s good friend, comedian Tony Vino, who presided over the questions from the audience. Jimmy said he was “thrilled to receive quite a number of interesting and thoughtful questions”. Watch Jimmy’s walkabout in Ormskirk. A wall of fame photograph put on Facebook includes legendary entertainers such as Ken Dodd, Victoria Wood, Jimmy Cricket and George Formby. The star-studded montage (right) of famous faces and celebrity autographs has been assembled over the years by Amy Phillips. Alongside Northern Irish entertainer Jimmy on the wall of fame is actor, Peter Sallis who played Norman Clegg in Last of the Summer Wine, English comedian, actress, singer-songwriter, screenwriter and director Victoria Wood, British comedian, actor and television presenter Joe Pasquale and George Formby, OBE, who was a British actor, singer-songwriter and comedian. George Formby was a major star of stage and screen in the 1930s and ’40s and his songs such as When I’m Cleaning Windows were particularly popular during the Second World War (1939–45). 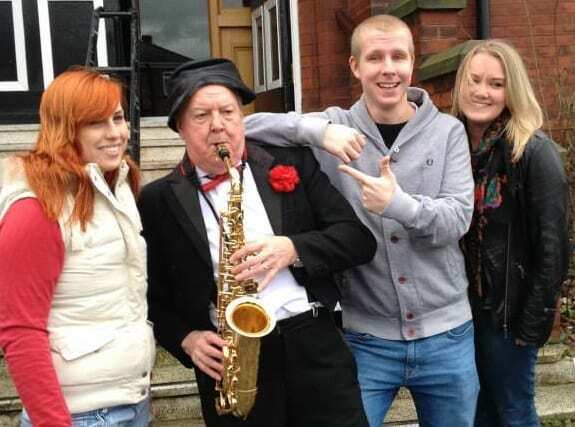 Jimmy Cricket decided to drop in on the good folk of Ormskirk ahead of his appearance at the town’s Civic Hall next month. The visit followed the famous Northern Irish entertainer’s successful walkabout in Stockport Town Centre. This time around he was ably joined by comedian Adam Ruston who is promoting Jimmy’s visit, along with Thea – Ormskirk Civic Hall manager – and Lauren, the bar manager at the venue. During Jimmy’s whistle-stop tour of downtown Ormskirk, he popped into the Lime Tyger bar and Disraelis 1 pub, and did a meet-and-greet around the main pedestrian area. Click here for more details about Jimmy’s show. Click the arrow button below to view a slideshow of photos of Jimmy’s walkabout around Ormskirk. 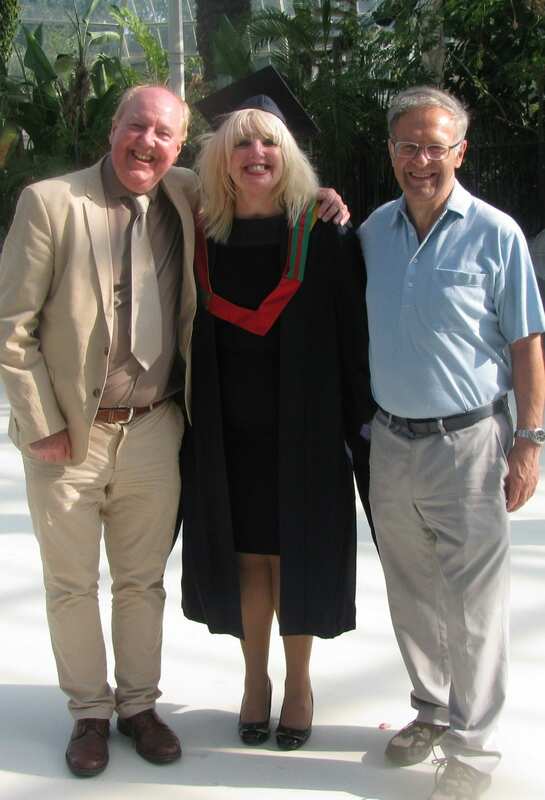 May Mulgrew, the wife of well-known entertainer Jimmy Cricket, celebrated a big personal achievement recently when she was awarded a masters degree in theology at Liverpool Hope University. The award came two years after May – a professional singer who also supports Jimmy in his work – had gained a bachelor’s degree at the same university. As she had enjoyed studying at the Merseyside university so much, she then decided to do a part-time Masters there as well. Above, May and Jimmy are pictured with their friend Bill Lees from Liverpool. Right, Jimmy and May – still dressed in her special university cap and gown went for a walk in the colourful Sefton Park following the ceremony and the weather was fittingly glorious.